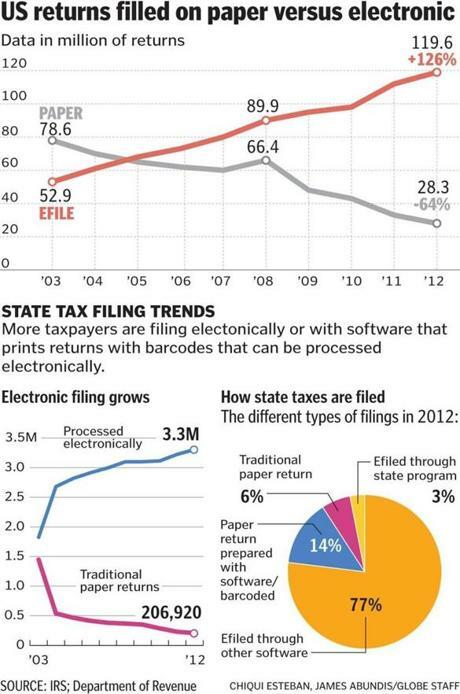 With the advances in technology and software programs, the Federal Government and the states are encouraging taxpayers to file electronically, rather than with the traditional paper forms. Image Courtesy The Boston Globe. However, regardless of age group or gender, many taxpayers who file their taxes themselves (without the help of a tax preparer or accountant), sometimes find the process not to be user-friendly, and typically resort back to filing with the paper form. Regardless of whether you file your taxes electronically or via the U.S. Postal Service, it is always important to have a paper copy of your return to keep in a safe place. There might come a time when electronic files will be 100% accessible without the worry of hackers or crashes, but until that time comes, a keeping hard copy of your taxes is a good safeguard to implement. So whether you are copying or printing a copy of your taxes, don’t run out of ink or toner! Cartridge World Bloomingdale, Downers Grove and Wheaton carry recycled and remanufactured cartridges that will save you up to 50% of the cost of their O.E.M. counterparts. Cartridge World is open seven days a week for your convenience. 358 W. Army Trail Rd. This entry was posted in Tax Season and tagged 2013, Bloomindale, Cartrige World, don't run out of ink, Downers Grove, electronic filing, frustration, Illinois, keep a paper copy, not too user friendly, paper filing, statistics, tax season, Wheaton. Bookmark the permalink.